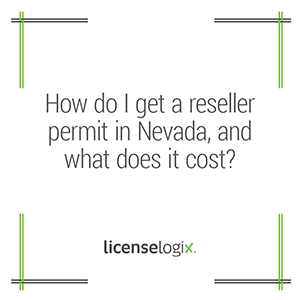 How do I get a reseller permit in Nevada? What does it cost? In order to hold a valid reseller certificate in Nevada, the business or individual must first obtain a sellers permit. The state fee for a sellers permit is $15.00 for each in-state location. If a business does not have a physical location in Nevada, it must still pay the minimum fee of $15.00. See Sales and Use Tax Registration for more information on how to obtain a sellers permit, quickly and easily.